Pardon my gap between posts, dear readers. I’m excited to announce that I started a new job two weeks ago! I’m starting a new career in advertising, and I feel really blessed to have this opportunity. The year 2014 is off to a great start! I mostly set my race calendar for 2012 and it’s quite packed, with 28 more upcoming races. I am planning to run in mostly local races this year, with a few exceptions. I am signed up for the Lululemon Seawheeze Half Marathon in Vancouver, and I plan to run in a few 100-mile races this year! So what have I been up to the past 2 months? I raced three half marathons in 4 weeks, with a 50-miler thrown in the middle. 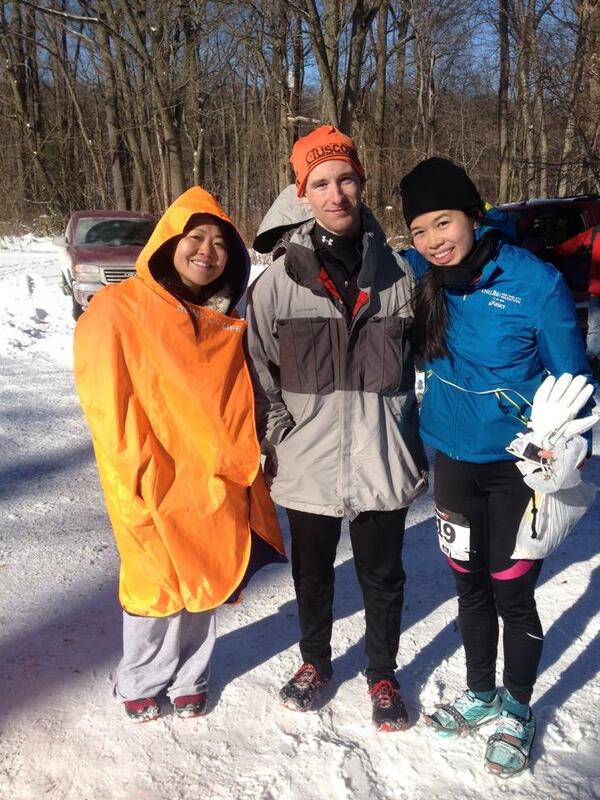 On January 4th, I ran the Watchung Trail half marathon in New Jersey, my coldest race ever at 0 degrees Fahrenheit. It was my personal worst for a trail half at 3:41:00, but I was so proud to just finish, as the blood was freezing in my veins and it took me forever to warm-up afterwards. It was a tune-up for my next race on January 18, the Beast of Burden Winter 50 in Lockport, NY. I went up with an amazing group of friends: Ken, Violet, Otto, Violet, Kat, Joe, and Kino as crew and pacer. Beth and Jim Pease hosted us once again in their lovely home, and it was the most fun I’ve ever had racing 50 miles in 17F weather! I finished in a time of 12:40:05, utterly spent but motivated to cheer on my friends running the 100-miler. That race will have its own recap in my next post. As if that wasn’t enough, I ran the Fred Lebow Half Marathon a week later as a training run on exhausted legs. It was also freezing, but I managed to finish in 2:14:47. This is actually good, because I just got the wonderful news that I will be pacing the New York City Half on 3/17/14 for the 2:15 group! I am so excited to pace this group with my wonderful friend Jackie Choi. Can’t wait! The winter of early 2014 will henceforth be known as the “polar vortex,” one of the snowiest and coldest winters I have experienced in a while. As a last hurrah before I started my new job, I treated myself to a getaway to Miami, FL, to run the Miami Half Marathon! I had a wonderful time recharging my batteries, eating great food, and seeing friends like Colleen, Kristen and Paul. Full recap to come in the next two weeks. 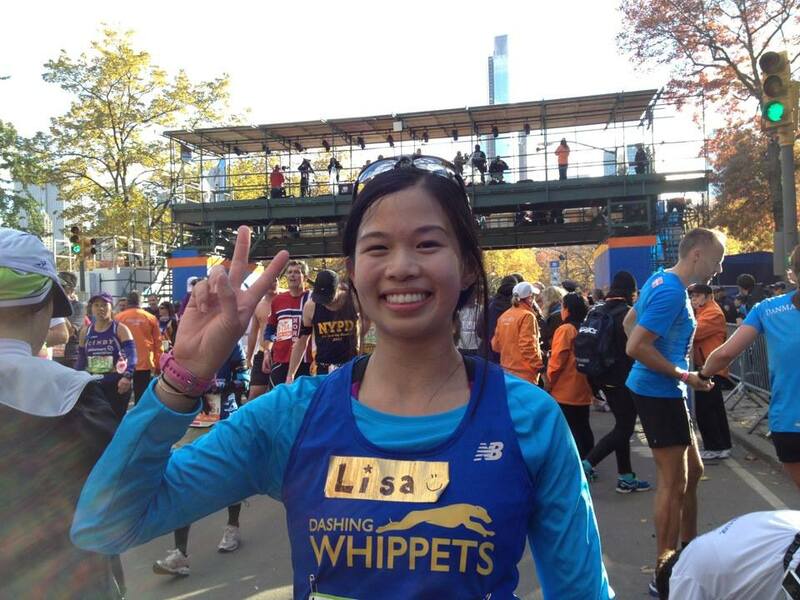 I had been aching to write a race report for two of my favorite New York City races: the ING New York City Marathon (held on 11/3/13) and the NYRR 60K (formerly the Knickerbocker 60K, held on 11/16/13). I would have felt like a bad New Yorker if I didn’t even mention these two races on my blog, even though they happened months ago. I had been waiting for 11/3/13 for a long, long, time. I had the honor of working the marathon in the years 2010 and 2011, but wasn’t allowed to run while working. I realized I really missed running the ING NYC Marathon, so I jumped at the chance to run it in 2013. I ran it in memory of my friend, Rob Petrocelli, who we had lost in 2013. It made the race even more meaningful. I had an amazing day. I ran into my Hawaiian friend Harvey Nakasone on the SI Ferry (total serendipity)! I also saw my good friends Juergen and Michele at the start, and we gave each other our good wishes. We warmed up with awesome Dunkin’ Donuts fleece hats at the start village. I was in the green start, wave 2, same as Michele! My sister Amy and my cousin Anthony were able to see me on the course. Amy caught me at Williamsburg (mile 12), and Anthony had an unplanned sighting of me at mile 26, because he was volunteering! I saw Shane cheering me at Mile 13.1, and he gave me a pack of peanut butter M&Ms to keep me going, haha. My legs were tired from running a 1:55 half marathon in LA the week before, but mentally I felt strong and I was just having an amazing time. I saw so many friends on the course–Otto’s 4:00 pace group passed me and I said hey, and so many Whippets were cheering in Harlem and Manhattan. The mood was so festive…a dramatic difference from the somber mood after the 2012 marathon cancellation. 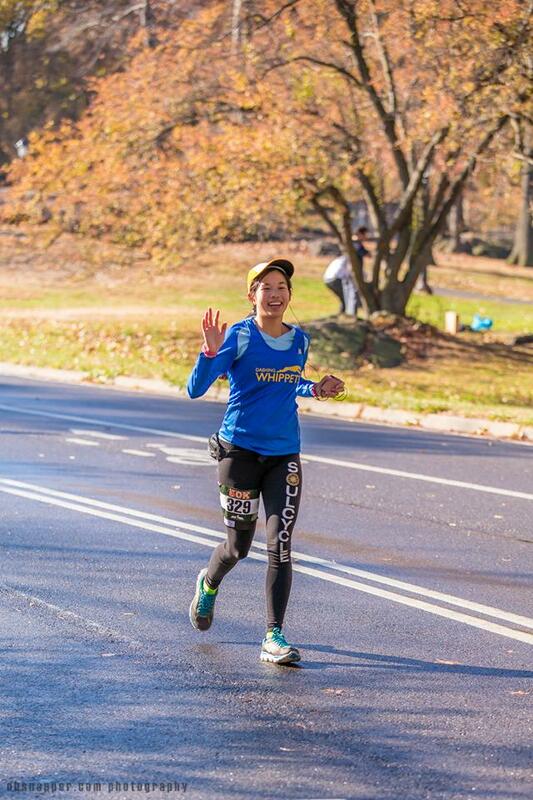 The NYC Marathon was back with a vengeance! I felt blessed to be running in my beloved city again, basking in all the cheers as if I were a celebrity. I couldn’t wait to get to the finish and see my friend Juergen (who was also finishing in the Team for Kids area), and to reunite with my mom and Shane. This year, we also had orange ponchos to look forward to in addition to the medal at the finish line. The weather was crisp and clear (about 55F) and I was running so close to my goal time of 4:30! I managed to finish in 4:33:14, but I was happy anyway. Although I was a tiny bit short of my goal, I had set a course PR! My previous course best was 4:52 way back in 2009. I had come a long way since then. Thank you to all my friends and family for your cheers and support! As if finishing the ING NYC Marathon wasn’t reward enough, a few days later, I entered a contest through Erica Sara Designs…and I won! Erica Sara Designs makes gorgeous custom jewelry, and a lot of their bling is race-inspired. I already had a necklace and a pair of earrings from her that I wear all the time, so this was a real treat. 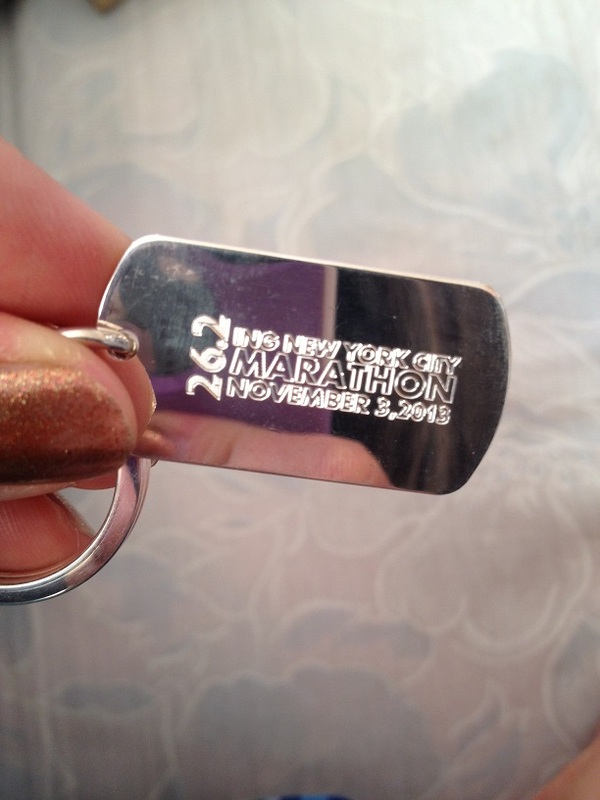 I opted to have the ING NYC Marathon logo engraved on it, along with my finish time and blog name on the back. This is very similar to the elite athlete gifts that her company was commissioned to do for NYRR. Thank you so much, Erica Sara! Last but not least, two weeks after the ING NYC Marathon (just as my legs were starting to forgive me), I ran the NYC 60K. It was formerly known as the Knickerbocker 60K, and it had been my first ultramarathon in 2010. It is somewhat masochistic to run 37.2 miles completely in Central Park, but it’s so easy for friends to cheer you on, and the camaraderie is great, so for me it was a no-brainer to do it. I had wanted to do better than the 7:05 that I ran in 2010, but I had to wait and see how my body felt. 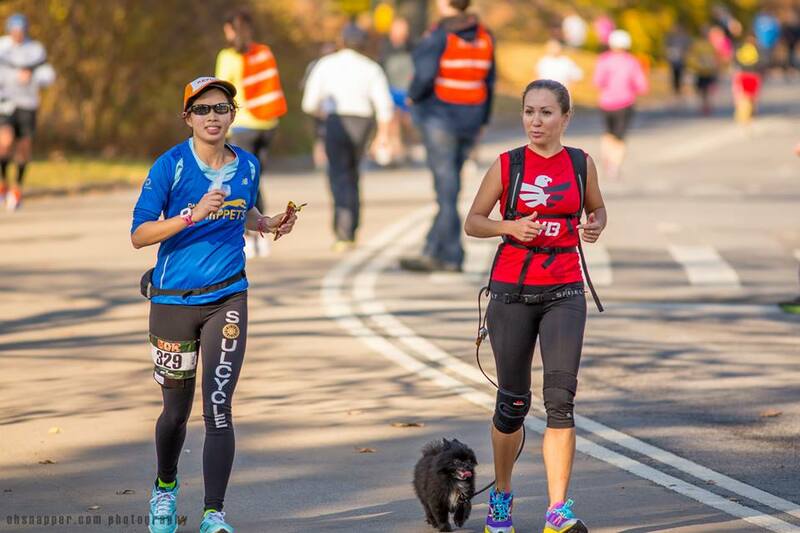 My friends Daniela, Claudia and Violet helped pace me, as well as Violet’s amazingly energetic Pomeranian, Jet. Violet & Jet ended up running 8 miles with me! Thank you to my dear pacers! I was so grateful for their company, as things were starting to get a bit mind-numbing after 4 laps. My friends Henry and Ken were running this as their first ultra, so I was rooting for them as well. After 9 laps, I crossed the finish line in 7:15:28! It capped off a long racing season for me, so I was proud. My legs weren’t so happy with me, but once I had my recovery meal at Shake Shack, the pain was mostly forgotten. Mom and Shane were at the finish line, as were my friends Michelle, Christine, Lisa and Gary (from Lockport, who also ran), Annette, Beth, and a ton of other Whippets. Sky and Tommy, my teammates, had podium finishes–Sky came in 2nd for women and Tommy was 3rd man overall. So glad to have run this race with so many of my dear friends! Categories: Uncategorized | Tags: Erica Sara Designs, Fred Lebow Half, ING NYC Marathon, Miami Half Marathon, New York City Marathon\, NJ Trail Series, NYRR 60K, Watchung Half | Permalink. This week was an emotional roller coaster, and I thank the powers that be for keeping my friends and family safe during Hurricane (aka Tropical Storm) Sandy. I pray for the victims of the hurricane that still have a long recovery ahead of them. The phone calls and texts were flooding in to make sure that I was doing ok. I thank everyone who sent me texts, emailed, or called–it really means a lot. Fortunately, my family was ok, the house was fine, and we still had electricity. Some of my friends were not so lucky. Most of Lower Manhattan below 37th Street had no power. My dad had to walk home on Tuesday from his hotel workplace near Grand Central all the way back to Brooklyn–it took him 2.5 hours because there were no trains working, and few cabs to be found. 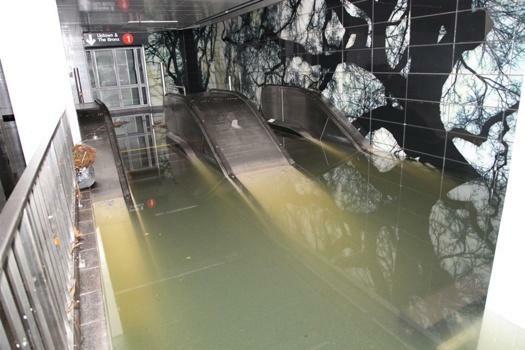 Staten Island and the Rockaways were devastated. Over 100 homes burned down in Breezy Point, Queens. I sent prayers and positive energy to all who needed it in the world. This whole week my office was closed due to a collapsed crane so I worked from home. Besides the minor inconvenience of no subways into Manhattan, I felt very lucky. 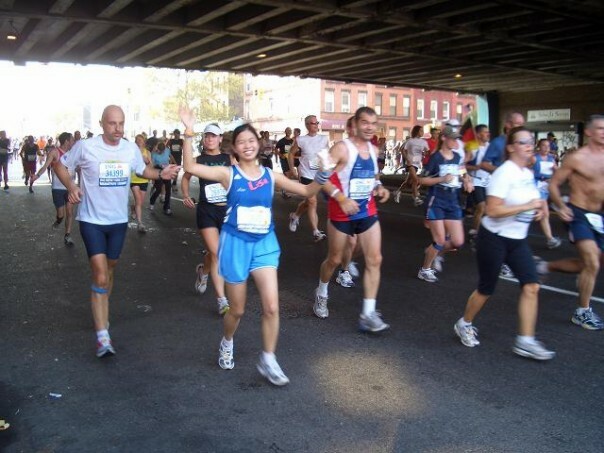 Then, on Friday around 5:30pm, it was announced that the ING NYC Marathon was cancelled. My friends all know how much the marathon means to me, so the news saddened me. I was supposed to host my friend Steven the night before the marathon. He deferred his 2012 marathon entry on Wednesday when he found out his flight was cancelled due to the hurricane. JFK was closed and reopened only on Wednesday. So today, on what was supposed to be Marathon Sunday, 11/4/12, I walked around Greenpoint instead. I was in the area caring for my sister’s cats, instead of being at a cheer zone and the finish line like I planned to. I felt a bit empty. To cheer up, I walked into Sips and Bites to buy myself lunch. 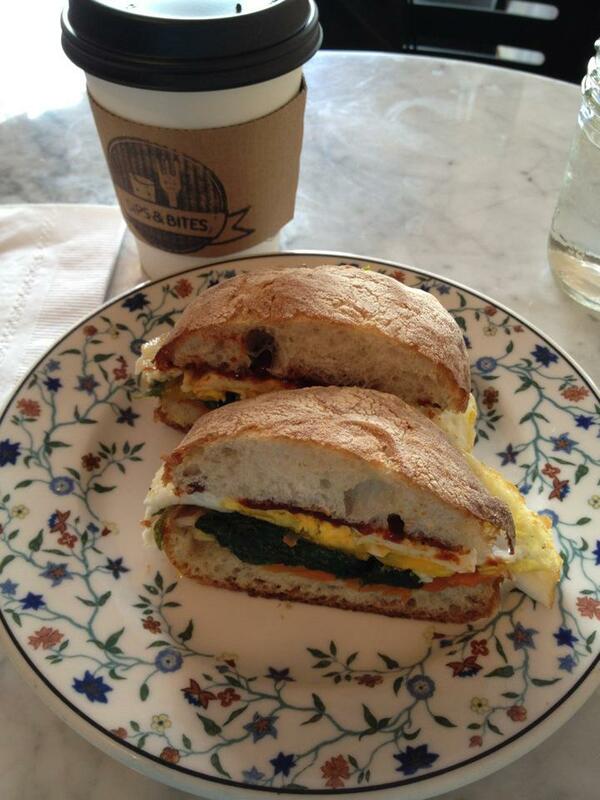 I bought a Fairyland sandwich (fried egg, spinach, Korean chili paste, mushrooms on a Parker House Roll) and got a free coffee with my Foursquare check-in. It’s the little things in life that make us smile. I read stories via Facebook about my friends volunteering in Red Hook, going for their own runs in the city, and setting up Red Cross fundraisers. I wanted to do something. I walked around the neighborhood and saw that Brooklyn Industries was collecting supplies for relief in Far Rockaway. I immediately walked into a bodega and bought some canned goods to donate. It wasn’t much, but the volunteers smiled and thanked me as I dropped them off. I love my city so much that it hurts to see it suffer. So I leave you with the following images. 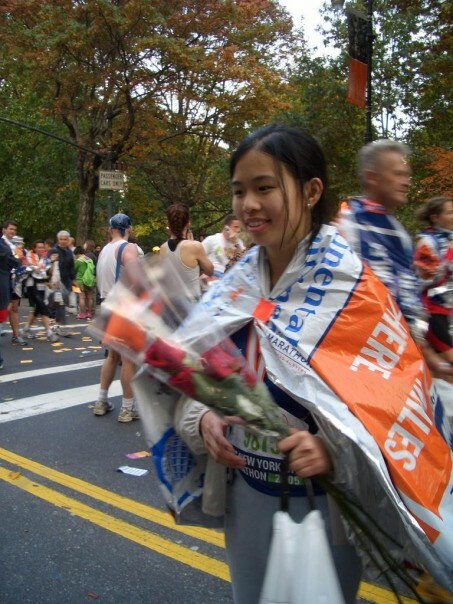 It was November 6, 2005, and I had just run the ING NYC Marathon, my first one ever. My mom, dad and sister cheered for me on the course. My boyfriend at the time, Jason, and his mom cheered for me from First Avenue and 60th Street in Manhattan. I heard the “wall of sound” on First Avenue. My friends Stasy and Kseniya gave me a bouquet of roses. I smiled so much that day. I crossed the finish line that day feeling like I could do anything. I vowed to try another marathon, just to get that feeling again. I was bursting with love for New York City. And I still am. 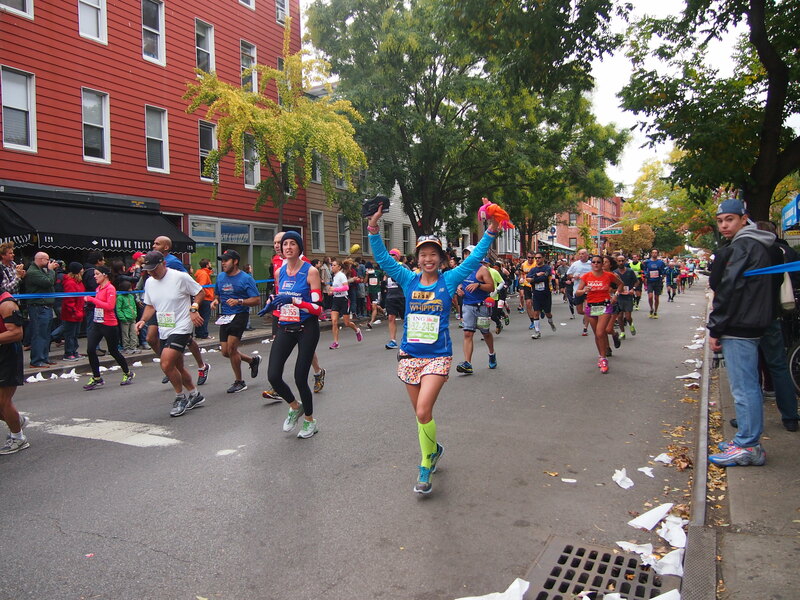 Categories: Uncategorized | Tags: Greenpoint, Hurricane Sandy, ING NYC Marathon, Sips and Bites | Permalink.